Have you recently received a notification that your mailbox is over quota, or close to it? Filling up you disk quota for POP accounts invariably results from your email client software not removing messages from the server after you have downloaded them to your computer. Typically, once an email message shows up in your inbox, there is no need to leave a copy on our mail server. In fact, leaving messages on the server will result in slower performance when downloading new email. Sometimes people wish to leave a copy of the message on the server for a few days after downloading, so they see their recent emails when using webmail. This is fine, but make sure to set your client software to remove messages from the server after 10 days or so. Click here for instructions for setting up various email clients to remove mail from the server after downloading. With IMAP mail accounts, all your email is stored on the server, so running into your quota is more common. Most IMAP email client software have a way to check your disk usage directly in the program. (for example, in Thunderbird, right click in the Inbox, select Properties, and then the Quota tab). You can also simply login to our webmail interface- you’ll see a “Quota Usage” status bar in the upper left of the screen. -File Menu -> New -> Folder..
-Mailbox Menu -> New Mailbox.. 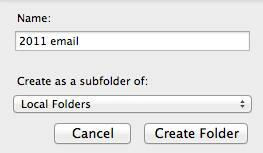 Remember that the Trash is just another IMAP mail folder. When you delete a message, the message is just moved into the Trash folder. We recommend setting your email software to empty the trash when you exit the email application. ce the new folder has been created, you can drag messages over from your Inbox to the new local folder, thereby removing them from the server. Give the folder a name, the folder should contain “Mail and Post Items”, and Select “Outlook Data File” as the place for the folder. Once the new folder has been created, you can drag messages over from your Inbox to the new local folder, thereby removing them from the server.